Cannon was a star all-purpose halfback in college who rushed for 1867 yards while averaging 5.2 yards-per-carry, caught 31 passes for 522 yards, and scored 21 touchdowns. He was a two-time consensus first-team All-American and winner of the 1959 Heisman Trophy, following a season in which he also returned a punt 89 yards to key a LSU win against Mississippi. 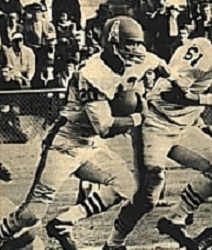 Cannon was chosen by the Los Angeles Rams as the first overall pick of the 1960 NFL draft, but signed with both the Rams and Oilers of the new AFL. A judge’s decision awarded him to the Oilers and he had a fair rookie season, rushing for a team-leading 644 yards and scoring a touchdown in the AFL Championship game on an 88-yard pass play. He was a second-team All-AFL selection by the league and UPI. Oilers went 10-3-1 to finish first in the AFL Eastern Division while leading the league in total yards (6288), passing yards (4392), touchdowns (66), and scoring (513 points). Won AFL Championship over San Diego Chargers (10-3). Cannon suffered a back injury that limited his effectiveness in 1962, holding him to 474 rushing yards although he still caught 32 passes for 451 yards and scored a total of 13 touchdowns. He saw little action in an injury-plagued 1963 season and was traded to the Oakland Raiders, where he was tried at fullback with some success before being shifted to tight end in 1965. While Cannon caught only 21 passes combined in his first two seasons at the new position, his production increased significantly in 1967, when he had 32 catches for 629 yards and 10 TDs and received first-team All-AFL honors from UPI and the Associated Press. He spent two more years with the Raiders and was an AFL All-Star in 1969. Cannon spent one last year with Kansas City as a backup in 1970. Altogether, he rushed for 2455 yards on 602 carries (4.1 avg.) with 17 TDs and caught 236 passes for 3656 yards (15.5 avg.) and 47 touchdowns. Cannon was a consensus first-team All-AFL selection after one season, received some first- or second-team recognition after three other seasons, and was chosen to two AFL All-Star Games. His son Billy Jr. played linebacker for the Cowboys for one year.